Here at Ellon Flowers we are fully aware just how special an occasion a wedding is, which is why we are delighted to be able to offer you a selection of wedding flower arrangements designed by the famous Vera Wang. The modern collection is perfect for those looking for fresh beauty for any wedding. Our florists in Ellon have over 40 years of experience in the floristry industry so you can trust that your Vera Wang wedding flower arrangement will be crafted with care and skill. 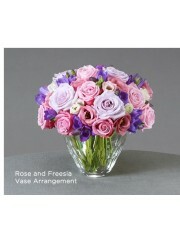 Our dedicated florists are also happy to provide any advice you may need concerning your special wedding flower order. After all, what is special to you is even more special to us at Flowers Ellon. We have a superb flower delivery service in Ellon and the local area, so you can count on us to deliver your wedding flowers safely and securely. However, just because your flowers are being ordered with the florists in Ellon doesn’t mean that your delivery is any way limited to the local area. As we are part of the Interflora brand we are able to deliver your wedding flowers to a huge range of locations across the United Kingdom. If your custom Vera Wang wedding flower arrangement needs to be delivered further afield Ellon Flowers can also help you, as we are linked to international flower delivery services, so your flowers can be delivered in 140 different countries across the globe. Our dedicated team at Ellon florists would be delighted to answer any queries you might have considering your important wedding flower order. We will be carefully surveying your order throughout the entire process, so your Vera Wang wedding flower order will be incredibly safe hands with Ellon Flowers. There is no need to have any concerns about trusting us here at Flowers Ellon with your beautiful wedding flowers. The florists in Ellon know just how important your wedding flowers are, which is why we believe that our Vera Wang wedding flower collection is a perfect option for a truly stunning wedding flower arrangement. The modern collection is a perfect option for those looking for a unique and striking feel for your wedding flowers. These modern flower arrangements are beautifully designed for bold tastes. 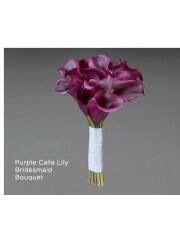 The Calla Lily bouquet in a selection of different colours is a simple and elegant choice for any bride looking for her flowers to make a large impact. 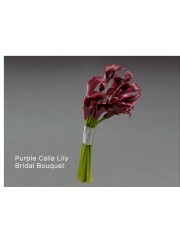 The Ellon florists are dedicated to making sure your exquisite Vera Wang bouquet is of the highest quality. For a more subtle choice, opt for one of the mixed rose bouquets, which will add a touch of delicacy to the floral arrangements. The modern Vera Wang wedding flower collection provided by Flowers Ellon also offers a variety of bouquets specifically designed for bridesmaids as well as corsages and boutonnieres. Their unique designs are sure to wow all guests at the wedding. 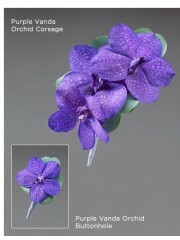 For a truly stunning and show stopping choice, the purple Vanda Orchid bridal bouquet is sure to please. Its elegance and complexity will definitely be a memorable choice for the glowing bride. Ellon Flowers are committed to making sure your Vera Wang wedding flowers are of the highest quality and delivered to you with speed and efficiency. We value your communication with us, so do not hesitate to get in touch with our team here at Ellon Florists if need be. 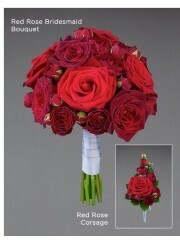 Trusting the florists in Ellon with your wedding flowers by Vera Wang is a fantastic choice. Weddings are designed around romance, which is why there is no need to look any further than the Vera Wang Romantic wedding flower collection provided by Ellon Flowers. 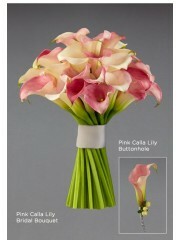 Their simple and timeless beauty makes them a great option to add a touch of delicacy to any wedding flower arrangement. The florists in Ellon know that for your wedding you will only want the best, which is why we are incredibly proud to be able to offer you the exclusive Vera Wang wedding flower collection. The Ellon florists have over 40 years of experience in the floristry industry, meaning that you can count on us to deliver. There is no doubt that your beautiful Vera Wang wedding flower arrangements will be created with delicacy and skill, leaving a truly incredible result. The Ellon florists are also able to help you by providing any advice you might need concerning your unique Vera Wang order. The friendly team at Flowers Ellon would also be delighted to hear from you or answer any queries you may have about your special order, as we realise just how important your wedding flowers are to you. Ellon Flowers is able to provide a reliable flower delivery service in Ellon and the surrounding area, meaning that your Vera Wang wedding flower order will be quickly and securely delivered to you. As part of the Interflora brand we are also able to deliver your special wedding flower order to a variety of locations across the United Kingdom. Should your Vera Wang wedding flowers need to be delivered further afield, Ellon Flowers is also able to deliver your flowers internationally, as we are linked to flower delivery services in 140 different countries. Here at Ellon Flowers we are dedicated to making your order as easy as possible for you. 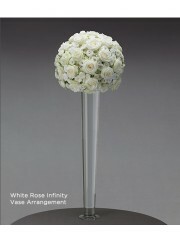 Make a fantastic decision by ordering your Vera Wang wedding flowers with Flowers Ellon today. We know you want the best for a wedding, so why not choose some gorgeous flowers from the Vera Wang Romantic wedding flower collection by Ellon florists today? This exclusive collection combines beauty and style to give a simply incredible result. From bridal bouquets to corsages and boutonnieres, Ellon Flowers can offer you anything you need with this unique Vera Wang collection. 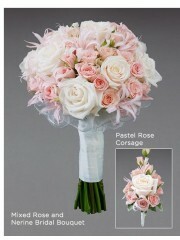 The cream rose and freesia bridal bouquet is an excellent choice for a bride looking for delicacy and grace. 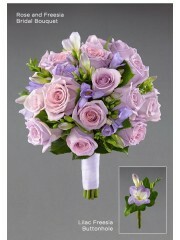 The gorgeous colour and gentle feel of this bouquet means that it is a sure winner with many. 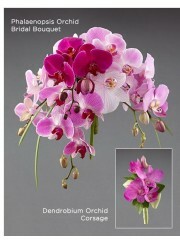 The rose and orchid bridal bouquet makes a bolder but by no means less beautiful choice, as it is sure to stun the wedding guests as the bride makes that memorable walk down the aisle. The romantic wedding flower collection by Vera Wang also offers unique corsages and boutonnieres for all wedding guests, which means that Flowers Ellon can cater to all aspects of the wedding flowers. We are dedicated to making sure your order is as easy and simple as possible for you, so for a gorgeous Vera Wang bouquet today, look no further than Ellon florists. 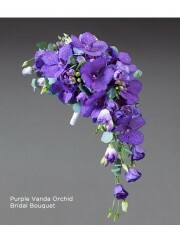 The unique nature of this collection means that you are able to order wedding flowers which no one will be able to forget. Style, luxury and elegance are perfectly combined in this incredible collection, all readily available for your choosing. 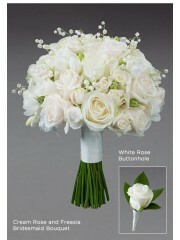 For true romance at your wedding, choose the Romantic Vera Wang wedding flower collection by Ellon Flowers. A wedding is a fantastic opportunity to celebrate true love in style, and there is no better to add style to the wedding with wedding flowers from the exclusive Vera Wang collection available at Ellon Flowers. 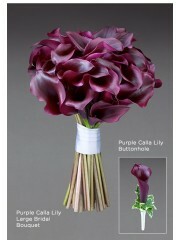 The traditional wedding flower collection offers classic choices for all your wedding flower needs. Our florists in Ellon have over 40 years of experience in the floristry industry, so we can guarantee that your Vera Wang wedding flowers will be arranged with precision and care. The florists are also happy to provide any advice you might require concerning your wedding flower order from the Vera Wang collection. The incredibly friendly team at Flowers Ellon would also be delighted to help any queries you might have concerning your order, so please do not hesitate to get in touch. Ellon flower delivery provides fantastic flower delivery service in Ellon and the local area, so your order will be safely and securely delivered to you. 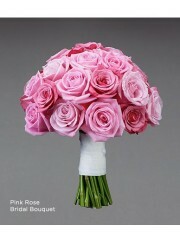 However, Ellon Flowers has more to offer in terms of flower delivery services for your wedding flowers. As part of the Interflora brand we can deliver your order placed in Ellon to a huge range of locations across the United Kingdom. Furthermore, if you need to have your wedding flowers delivered internationally we are also able to deliver abroad in 140 different countries across the world. There is no need to worry about any extra requests you might have, as the Ellon florists will try their very best to accommodate them for you. Our dedicated team will carefully oversee every step of your order process until it is safely delivered, do your Vera Wang wedding flowers will be well looked after. For high quality flowers and reliable service, look no further than Ellon Flowers for wedding flowers from the Vera Wang Traditional wedding flowers collection. Ellon Flowers know that you want the best for your wedding, which is why we are delighted to be able to supply you with the best wedding flowers we have on offer. The traditional wedding flower collection designed by Vera Wang is a perfect choice for those looking for classic and elegant simplicity. The stunning bridal bouquets we have on offer are sure to impress as the glowing bride makes her important journey down the aisle. Here at Flowers Ellon we realise just how beautiful an occasion a wedding is which is why we want to provide you with equally beautiful flowers. As well as bridal bouquets the traditional wedding flower collection also offers a range of corsages and boutonnieres to satisfy all the needs of your wedding guests. 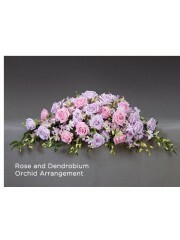 There are also other flower arrangements which the florists in Ellon can offer you from the traditional wedding flower collection by Vera Wang, such as the rose and cymbidium flower arrangement vase and the magnificient rose and lily arrangement which would be perfect to decorate any service or reception venue. The Ellon flower delivery service is a fast and reliable way to have your flowers delivered to you safely. 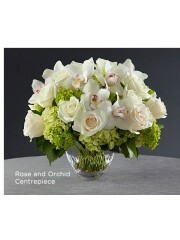 Here we know just how important your wedding flower arrangement is, which is why we treat it with such care. We thoroughly advise you to order stunning flowers from the traditional wedding flower collection designed by Vera Wang and supplied to you by Ellon Flowers. Add a touch of magic to this very special day with a designer bridal bouquet in wonderfully feminine shades of cool lavender and lilac. Let this arrangement of premium roses and scented freesias add a touch of classical beauty and designer chic to your ceremony or reception. For your wedding we at Flowers Ellon know that you want only the best so we offer you the Vera Wang Wedding Collection with beautiful designs created by Vera Wang using the most luxurious flowers. When you order Vera Wang Wedding arrangements you know you’re ordering the best and our Florists Ellon will be delighted to recreate the designer’s vision for you for your special day. The best thing to do when ordering wedding flowers is to book a consultation with our trained and skilled wedding Florists Ellon who will help you carefully plan the wedding of your dreams with only the best flowers that will stun all of your guests and leave a lasting impression of your wedding as being one of the most beautiful they’ve ever attended. We will provide all the flowers you need from large arrangements through to the bride’s bouquet and even any corsages and buttonholes you need so you don’t have to look further than Flowers Ellon when it comes to ordering flowers for the big day. Once you’ve decided what you need our Florists Ellon will take care of everything, making sure every single detail of your flowers is perfectly suited to your requirements and absolutely fresh and gorgeous on the day. Then we’ll personally deliver your flowers wherever you need them to go, directly to the venue, so that you can concentrate on the best day of your life while we at Flowers Ellon take care of everything flower related and leave you to think about other things as we know you don’t need to think about flowers on this special day. Your flowers will be exactly what you wanted when you let our Florists Ellon realise your vision for the perfect wedding flowers you have always dreamed you would have on your big day.